Estimated Sales 20,000 units @ $5 P.U. Production and Sales will remain similar throughout the year. Production costs: M – 2.5 P.U., Labour 1.00 P.U. Overheads $17.500. Customers are given 60 days credit and 50 days credit from suppliers. 40 days supply of raw materials and 15 days supply of finished goods are kept in store. Production cycle is 20 days. All materials are issued at the commencement of each production cycle. 1/3 on an Average of working capital is kept as cash balance for contingencies. 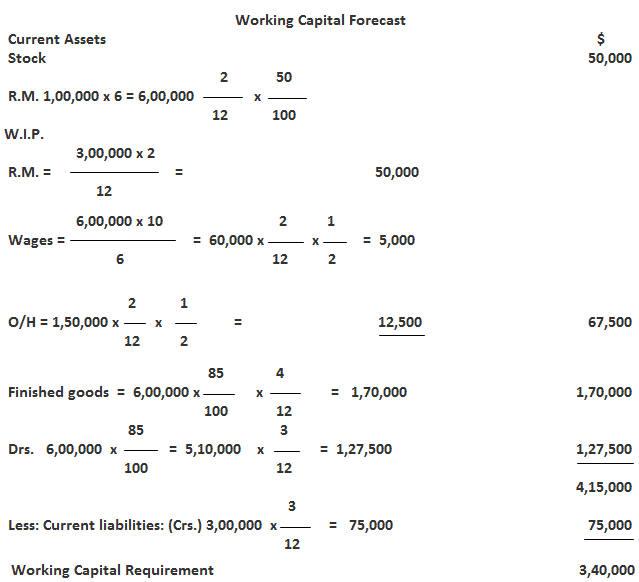 Calculate Amount of Working Capital. Raw material remains in stores for two months, finished goods remain in stores for 4 months, credit allowed by crs. 3 months from the date of delivery of goods (Rm) credit given to Drs. is 3 months from the date of dispatch. Production cycle is 2 months. Sale price per unit is $6. Production and sale are uniform during the year. Libro Ltd. has $3,50,000 Share Capital, $70,000 G.R., $3,00,000 Fixed Assets, $30,000 Stock, $97,500 Drs., $15,000 Crs. It is proposed to increase the business the stock level by 50% at the end of year. Crs. are doubled. Machinery worth $15,000 is proposed to be purchased. Estimated profit during the year is $52,500 after changing $30,000 Depreciation and 50% of profit for taxation. Advance income tax is estimated to be $45,000. Crs. are likely to be doubled 5% dividend be paid and 10% dividend for the next year to be proposed. Drs. are estimated to be outstanding for 3 months. Sales budget shows $7,50,000 as sales for the year make a working capital forecast by projected Balance Sheet Method.